*NEW this year, if you would like feedback on your nomination from a member of the Awards & Selection Committee (not the judges) before formally submitting your nomination, please submit your draft by July 1 via email with a note to that effect. 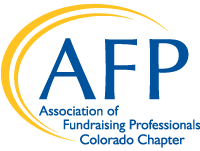 The Association of Fundraising Professionals Colorado Chapter defines diversity as the seeking and achievement of a broad representation of experiences, perspectives, opinions, and cultures within philanthropy. The National Philanthropy Day Steering Committee encourages nominations from all individuals, groups, and organizations representing all regions of Colorado. We believe that inclusiveness is an essential source of strength and vitality. Please read all of the information and instructions before writing your nomination. All nominations must be complete when submitted. Complete nominations must be submitted via email. 1. What are the nominee's specific achievements? 2. What impact has the nominee had on the community through financial contributions and/or volunteerism? What impact has the nominee had on efforts to promote diversity? 3. What leadership qualities does the nominee possess that promote philanthropy and/or volunteerism? Every nomination is unique, these examples are provided to show you successful nominations. Please tailor your nomination to your nominee and award category.